Chicky Chicky Parm Parm. Have you seen Parks & Recreation? It is an Emmy winning comedy show on NBC. It is such a breath of fresh air when all you usually see on TV is terrible reality shows. The cast on Parks & Rec is utterly hilarious. Here is a clip you just have to watch. I love each character individually that I can’t pick a favorite. I hope you found that as delightfully funny as I did. Now on to the recipe…. 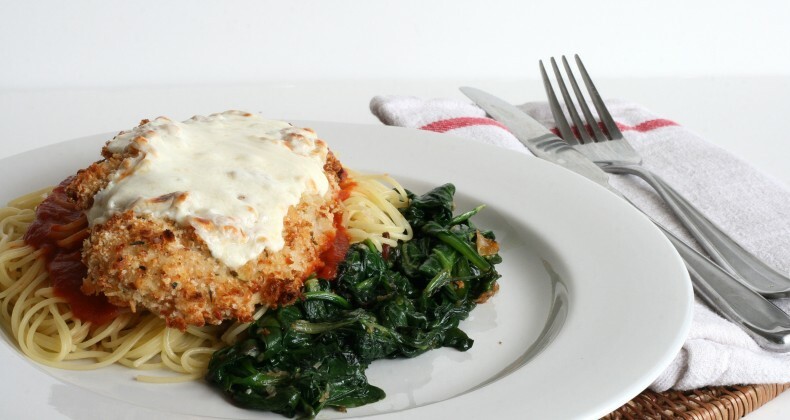 Chicken Parmigiana aka Chicken Parm aka chicky chicky parm parm is a chicken breast or cutlet dipped in bread crumbs, fried, then topped withÂ mozzarella that is baked until bubbly. While it sounds wonderful it isn’t exactly wonderful for your waistline. So for dinner I decided to bake it instead of fry it to save a few calories. Awhile back I made Parmesan Chicken Bites and this is pretty much the same thing except with full size chicken breasts. I don’t know if your grocery stores are like mine but the chicken breasts they carry areÂ enormous. Out of curiosity I weighed the two chicken breasts I use and one was 10 ounces and the other 12 ounces. Poor chickens. I cut the chicken breasts in half lengthwise to give me four 5-6 ounce chicken cutlets. Which was a generous serving size. SpinachÂ sautÃ©edÂ with a little garlic rounded out my dinner. Now I can’t claim this is better thanÂ restaurantÂ chicken parmigiana because I have never ordered it at aÂ restaurantÂ before. I can say that it was quite scrumptious and hope you give it a try. Preheat oven to 425 degrees F. Place oven rack in middle. Scramble together egg whites and milk. Set aside. Pour breadcrumbs, Italian seasoning, and Parmesan cheese into a pie plate. Stir to combine. Dry off the chicken cutlets. First dip cutlets into egg white mixture then in breadcrumbs. Make sure to press breadcrumbs onto cutlets. Place on a parchment lined baking sheet. Lightly spray the tops of the cutlets with cooking spray or olive oil. Bake for 20 minutes. Top each chicken cutlet with 1 ounce of mozzarella. Turn oven to low broil. Broil for 3-5 minutes or until cheese is melty and beginning to brown. While chicken is baking boil up the pasta and warm up the marinara sauce. In a sautÃ© pan, heat up 1/2 tablespoon olive oil. Add 2 minced gloves of garlic and sautÃ© until softened. Toss in a couple large handfuls of baby spinach. It will cook down Cook until the spinach has wilted. 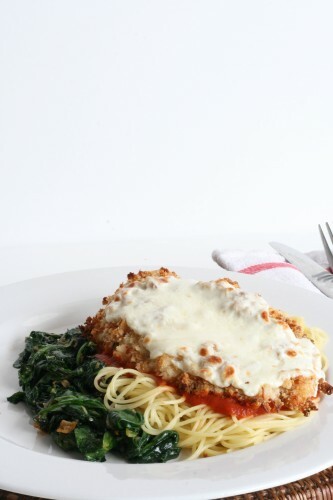 Serve alongside the chicky chicky parm parm. Plate up a small serving of angel hair pasta topped with 1/2 cup of marinara sauce. Place chicken cutlet on top of the pasta. Enjoy! Jamie! Thank you for this recipe! I’m totally going to make it this week with gluten free bread crumbs:) I tried to make my own version before and didn’t cut the chicken breast 1/2 … this will be much better for multiple reasons! Love the spinach for a side dish as well.